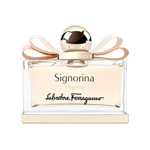 Salvatore Ferragamo's UOMO is a contemporary and charismatic Oriental/Woody creation that leaves a lasting impression, just like the man who wears it. An elegant embodiment of masculinity where vibrant woody notes interplay with invigorating... Salvatore Ferragamo's UOMO is a contemporary and charismatic Oriental/Woody creation that leaves a lasting impression, just like the man who wears it. An elegant embodiment of masculinity where vibrant woody notes interplay with invigorating gourmand notes of pure seduction. A fresh and cool opening, infused with an irreverent sense of charm, uses unexpected ingredients of black pepper, cardamom and bergamot. The heart of the fragrance is built around an iconic and classically Italian ingredient, Tiramisu. The combination of orange blossom and ambrox, perfectly represent the duality of Italian men: strong, confident and roguish, yet seductive and sweet. Cashmere wood and sandalwood seal the fragrance with a touch of tonka bean, leaving an indelible mark with enormous long lasting qualities.